RHINO delivers top-of-the-line North American steel buildings at competitive prices to Canada, Mexico, and every state in the U.S. Regardless of the project, RHINO-tough pre-fab metal building kits are designed and fabricated to meet each customer’s exact requirements. Repeat buyers — and new customers referred to RHINO by those happy customers — generated over 34% of our orders for North American steel buildings in the past twelve months. We think that speaks volumes about the quality of our steel building system and the above-and-beyond service we provide North America. Pre-Fab Metal Buildings for the U.S. Looking for construction by state? RHINO provides steel building kits for every state in the U.S. From Barrow, Alaska to Cape Sable, Florida, RHINO delivers interstate steel buildings at the right price all across the country. All of our pre-fab metal building kits are unique. Customizing the basic “box” design of steel buildings is simple and economical with the many options available from RHINO. Every building is designed to meet or exceed all local codes, and all plans are stamped by an engineer licensed in that state. Plus, multiple manufacturing and shipping points available across the U.S. keep shipping costs to a minimum. 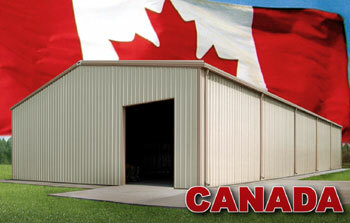 RHINO offers interstate steel buildings all across Canada as well. Our North American steel buildings meet or exceed all local Canadian building requirements, including snow loads and high wind loads, and optional Pro-Value insulation packages keep buildings snug during cold Canadian winters. North American steel buildings destined for Canada ship directly to the job site from the nearest U.S. facility. 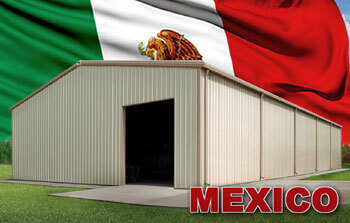 RHINO Steel Buildings Systems ships anywhere in Mexico. Our strong, durable metal structures can take on Mexico’s earthquakes, hurricanes, and extreme heat challenges. Furthermore, optional add-ons like reflective, cool steel exterior panels and Pro-Value insulation packages help manage the Mexican heat. Finish your North American steel building in stucco, stone, wood, or glass for your ideal look. From personal use structures, to mid-sized commercial buildings, to massive manufacturing plants, hangars, and warehouses, RHINO buildings can do it all. 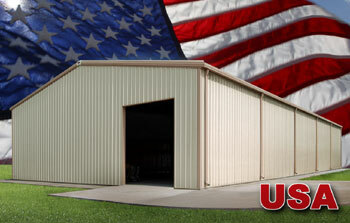 Get more information about pre-fab North American steel buildings by speaking to one of our metal building specialists. Call us to get a free quote. U.S. residents: 940.838.9566. Canadian or Mexican residents: 011.940.383.9566. Share the post "Product by location"